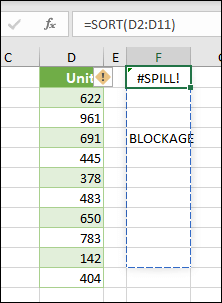 This error occurs when the spill range for a spilled array formula isn't blank. When the formula is selected, a dashed border will indicate the intended spill range. You can select the Error floatie, and choose the Select Obstructing Cells option to immediately go the obstructing cell(s). You can then clear the error by either deleting, or moving the obstructing cell's entry. As soon as the obstruction is cleared, the array formula will spill as intended.